The city of Echo has issued an apology for statements made by city councilor Lou Nakapalau on Facebook calling a gay man an anti-gay slur and telling him that when he dies of AIDS he will spit on his grave. City councilor Robert Harris proposed issuing the apology during Thursday’s council meeting — the first since Nakapalau made the comments on Oct. 7. “I think that’s the absolute least we can do,” Harris said. His motion was met with several seconds of silence from the rest of the council, prompting an outcry from audience members as it looked like the motion might die from a lack of a second. Harris looked at councilor Jerry Gaunt, who told Harris he didn’t have to second it, but councilor Janie Enright said she had seconded the motion while people were talking. The council, including Nakapalau, then voted unanimously to approve the motion. Nakapalau did not offer any comment during the council meeting and has not returned requests for comment. The Facebook comments in question happened on the Facebook page for “Kumu Hina,” a documentary about a transgender Hawaiian woman. Nakapalau argued with filmmaker Joe Wilson about transgender rights, culminating in his comment about spitting on Wilson’s grave. The comment has since been deleted and Facebook shows Nakapalau edited another part of the conversation to remove profanity. Thursday’s meeting started with public comment from Vickie Read of Parents, Families & Friends of Lesbians and Gays. Read, who is from Pendleton, said if the city does not publicly condemn Nakapalau’s words that could imply other city leaders support the ideas he expressed. Read said she regrets her own ignorance in years past, when her son, who was 17 at the time, told her he was gay and she responded by saying he didn’t fit the stereotypes she had grown up with and so it wasn’t possible for him to actually be gay. Jenny Sullivan of Hermiston also spoke up, saying she couldn’t imagine a gay person wanting to move to the area after reading the comments. “I’m absolutely disgusted and think any self-respecting council would throw him off,” she said. After the council addressed agenda items, Harris said he had not been able to find any sort of policy about Echo councilors’ speech or social media use, and proposed that the council come up with an ethics statement and social media policy to provide guidance for any future incidents, and also that the council issue an apology. City administrator Diane Berry said she had brought examples of such policies before the council in the past and they had not expressed interest in adopting them, but she could bring them forward again. She cautioned, however, that cities are much more limited on what they could do to an elected official versus a city employee. City attorney Bill Kuhn said the council was “not in a position” to remove a fellow councilor from office, but the council could ask for an apology from Nakapalau or post something on their own Facebook pages. Harris said he wasn’t trying to remove Nakapalau from the council but did think they needed to send a unified message. “It was mystifying to watch a group of elected officials struggle to understand how to do the right thing about the hate speech of one of its members,” Reese said. She said that while she supported an apology, she thought it would be more appropriate to take a stronger stand by calling for Nakapalau’s resignation. 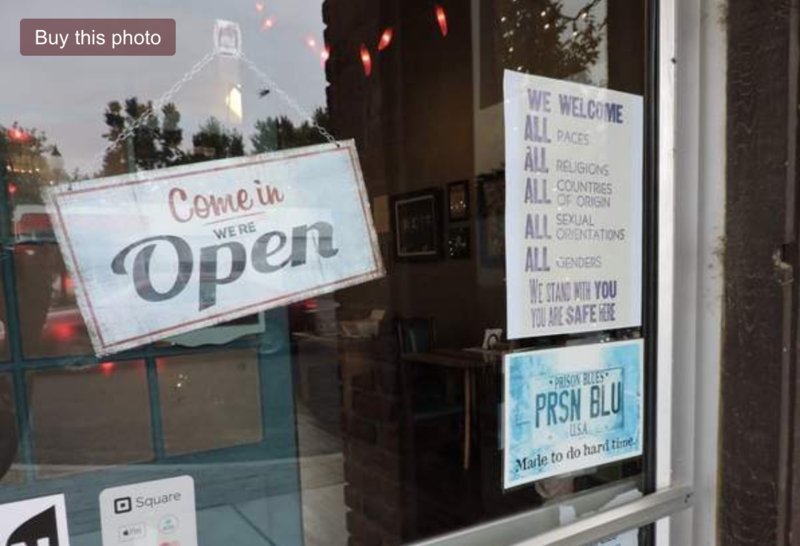 She and a few other business owners have placed signs on their door stating that they welcome all races, religions, countries of origin, sexual orientations and genders in response to the controversy. “We stand with you. You are safe here,” the sign states. In 2014 Echo School’s student government president was Zach Christensen, an openly gay senior. Christensen, who lives in Stanfield, said while he was going to school in Echo he did receive pushback from some adults on a proposal to start a Gay-Straight Alliance chapter. But the chapter was approved, and he said friends, classmates, family and members of his church from the area were mostly supportive, despite Echo being a small, largely conservative town. He said he feels Nakapalau is entitled to express his opinions. But he also said Nakapalau should realize that the consequence may be a backlash from people who disagree with his views. “It’s not the mistakes we make that define us, it’s how we move forward from our mistakes,” he said. A sign on the door of the Buttercreek Coffeehouse and Mercantile in Echo states people of all sexual orientations are welcome.